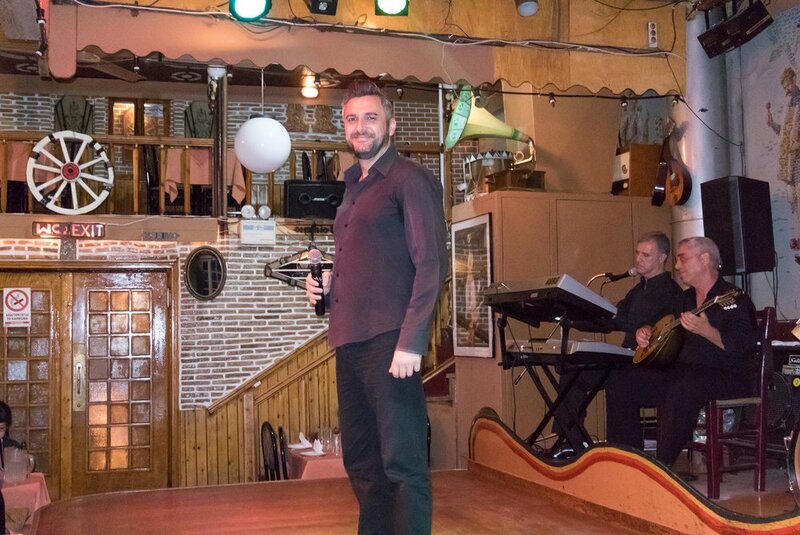 A couple of minutes away from the Acropolis in Athens, at the heart of Plaka you will find a one hundred year old folk musical tavern. You will love the musical program with Greek folk costumes and dances from all the Greece. Also the oriental dances will delight you. The Syrtaki, Zorbas the Greek, Zeibekikos dance and traditional songs, promise a night you will never forget. Ballos dance from the islands of Cyclades. Marinos is dancing on a glass. Neos Rigas is beautiful and hospitable. Walk-ins are welcomed. We will make you feel like home from the very first moment. An excellent choice for groups. It is a hundred year old tavern. One of the oldest in the Plaka district. In its present form dates since 1935. It has a history of four decades as a folk music tavern. Hundreds of thousands have enjoyed our food, dances and music since 1975. New Rigas is the only place for Athens by Night. The best dancing group of Athens, wearing folk costumes, is dancing for you on the dance floor of Neos Rigas. The group presents a large variety of old traditional dances from the islander space of Greece (Eptanisa, Dhodekanese, Cyclades) and the mainland of Greece Thessaly - Epirus - Thrace- Northen Trace. New Rigas is the gem of Plaka. You will have the chance to dance with our professional and very experienced dancers. You will soon learn the basic steps of the most popular Greek dances. The show is interactive. Everybody is welcomed. The folk costumes our dancers are handmade. Every regional dance demands its proper costume. 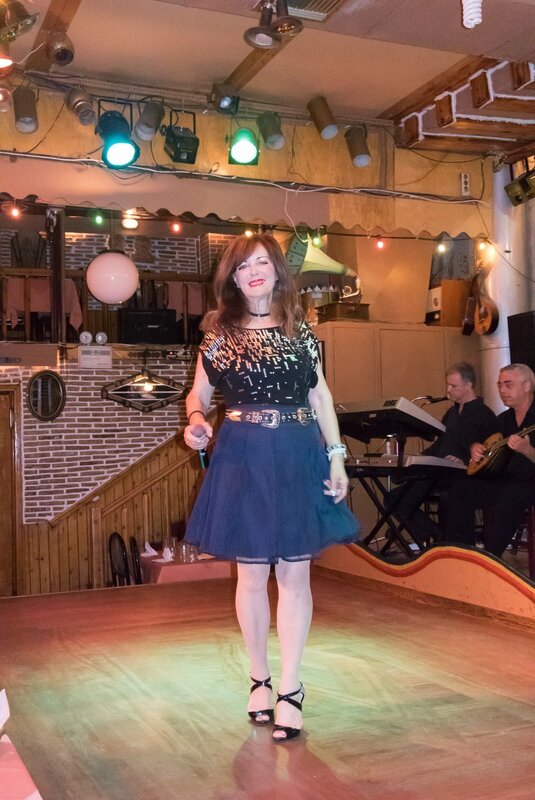 Our beautiful belly dancer can perform all kinds of regional oriental belly dances (Egyptian, Persian, Turkish, Arabic). She is wonderful with the sword or the cane. Ours guests will have the pleasure to be taught the basics of belly dance. The menus are delicious and based on the traditional Greek cuisine. And to satisfy you, we have very low prices. The prices are equally affordable like those of ordinary Athenian taverns that lack live music or dance groups. Fennel fritters (marathokeftedes) with Shrimp coctail. In New Rigas you will taste an extensive variety of traditional Greek delicacies while viewing our folk music program. You can relax and enjoy your dinner and drink. We offer à la carte menu. A children menu at a discount price is available too. The menu varies according to seasons or the holiday periods of Christmas, New Years Eve, Carnival, Easter etc. Vegetarians won't be disappointing. Our customers are from all over the world and we have many decades of experience with various dietary needs. For large groups we can offer special dishes according to their culture (Muslims Halal, Jews Kosher, Indian cuisine etc). Please inform us beforehand. Our chicken, lamb and beef have halal food certification which we can show to you. Nearly all food ingredients are from Greece. For any special request please inform us and will be happy to serve you. The New Rigas music tavern of Athens has a rustic environment with Greek folk art decoration. The tavern has a dance floor and 400 seats in two stages. Entrance of Neos Rigas music tavern. Dance floor of Neos Rigas. The upper stage with great view. The elements that surround the place are wood and stone. It has a wonderful ambience. On the walls there are handmade murals that show traditional scenes, and the decoration is taken care to the last detail. New Rigas has an atmosphere that will make you think that you are in the old Athens. The tavern has 400 seats. Free high speed WiFi internet is available to every customer. Every place inside the tavern has a strong signal. The access to internet is fast and without any restriction. Because New Rigas music tavern is usually full of foreign customers eager to post their experiences in social networks, we have two separated lines with very fast WiFi internet connections. Everyone can access the internet with decent speed. Please ask the staff for the connection details of both WiFi hot-spots. New Rigas tavern has a very efficient air ventilation. It is fully air conditioned all the months of the year. During the hot summers when the weather gets warm, it is the coolest place to be. It is a smoke free tavern. Smoking is prohibited due to the recent anti smoking laws. However smokers can enjoy their cigarette at the entrance and return to their table afterwards. New Rigas tavern is a safe place to be. There is an emergency exit, safety lights, and fire prevention. Even in the case of power failure from the national electric grid we have electric generators. So your enjoy is guaranteed. The tavern has a long history. In 1935 it was named the Tavern Of Anousis. It had guitars and local singers. It was known for its good wine from the big wine barrels inside. Later it was a mainstream music scene with popular artists like Mary Linda and Manolis Chiotis. For a short period it was converted into theBouat Mikrokosmos(A kind of a small music venue with political and new wave music). It hosted artists like Maria Dimitriadi, Vasilis Papakonstantinou, Giannis Koutras, Giorgos Meranzas and others. Our musicians have a terrific taste of music. New Rigas is the best live Greek folk music venue. Our singers are experienced to sing in many languages. This is unique in Athens. They can sing in languages from east Europe (Serbian, Croatian, Bulgarian, Romanian, Moldovan, Hungarian, Russian, Lithuanian, Latvian, Polish, Turkish, ) and also Arabic, Farsi, Chinese (Mandarin, Cantonese, Taiwanese Mandarin), Spanish (song from south America and Spain), Thai, Malay, Hindi, Japanese, English, French, German, Italian, Portuguese, Maltese, Irish, Jewish. We always welcome our foreign guests in their ethnic language. The music tavern features musicians that can play many foreign songs that our customers are pleased to hear. We can arrange our music program and dancing according to the will of large groups. For a special requests inform us a little earlier.